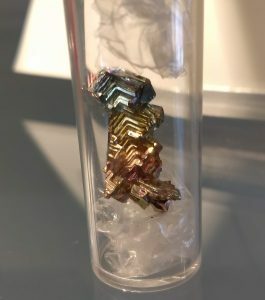 Colored bismuth crystals, bright copper, silicon circuits, and more shine in our new exhibit celebrating 2019: The International Year of the Periodic Table! One hundred and fifty years ago, Dmitri Mendeleev published a draft of the first Periodic Table. Mendeleev also wrote “Knowing how contented, free and joyful is life in the realms of science, one fervently wishes that many would enter their portals” in his text Principles of Chemistry. Enter the portal to the Sciences Library to test your knowledge of the elements present in household items, to view our humorous periodic tables, and to see several elements in their pure form! Thank you to Dr. Lou Messerle for loaning us his collection of element samples! In 1869, chemist Dmitri Mendeleev discovered patterns among elements that led him to arrange elements according to their properties into the very first periodic table. Several years later in 1885, the Periodische Gesetzmässigkeit der Elemente nach Mendeleiff was created, which was recently found at the University of St Andrews. 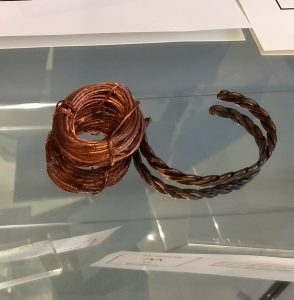 This is thought to be the oldest surviving periodic table in the world! 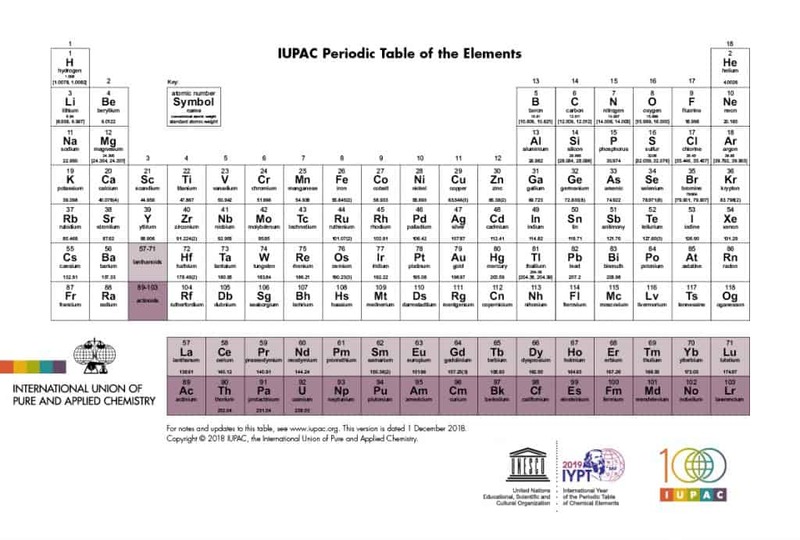 Now, 150 years later after Mendeleev’s discovery, the UN and UNESCO have declared 2019 to be The International Year of the Periodic Table. Learn about each of the elements through IUPAC’s interactive Periodic Table! 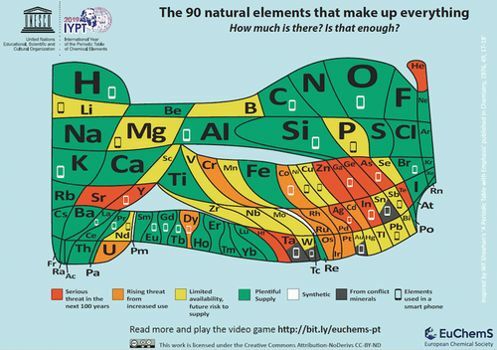 Elements marked with gray are from conflict minerals, all of which are used in smartphones. Elements in red are the most at risk of running out. Would you miss any of these elements if they were gone? Is there more that we can do to recycle and reuse these naturally-occurring elements? There are now 118 elements, and the newest elements are nihonium (Nh), moscovium (Mc), tennessine (Ts), and oganesson (Og). These four new elements were created synthetically. Interested in a competing for a limited edition Periodic Table signed by a Chemistry Nobel Laureate? Take IUPAC’s Periodic Table Challenge and enter their Nobelium Contest for a chance to win!